I’ve always had a phobia for making slash openings. So I’ve been astonished how often they appear in Very Easy patterns or patterns for beginners. But I’ve found very little on the internet about sewing them, so perhaps everyone else does find them easy ! Me, I found it impossible to make them so the end lays flat without crinkles. And strong enough that it doesn’t fray or tear easily. The secret is that for many years I’ve been using the wrong method. And now I’ve tried a different method – they really are quite easy ! Here’s an example of sewing a narrow V shape. It’s obvious that it’s nearly impossible to cut between the sewing lines right down to the bottom of the slit. And if you did, the seam allowances would be almost non-existent. Whenever I’ve tried turning this sort of V, I’ve got a lumpy wavy mess. Not something I want in the middle of the front of my garments. Several books tell you to use this method (e.g. ‘Simply the Best’ p.229, Rene Bergh ‘Dressmaker’s Handbook’ p.69). So, many people must get a good result this way. Good for you if you can do it. But I’ve never managed it. The alternative is to sew a blunt-ended slit, with some stitches sewn across. This is a combination of methods in Kwik Sew 3302 and ‘Professional Sewing Techniques for Designers’ p.326, plus some little bits I’ve noticed myself. Fusible interfacing of course helps stabilise fabric and strengthen the end of the slit, but it isn’t essential unless the fabric frays easily. If you don’t want to interface the entire facing but want to strengthen the end of the slit, use a 2-inch square of interfacing at the end. Use light interfacing which barely adds any bulk. Mark the slit stitching lines on the interfacing, or on the back of the facing fabric. Lines at the open end need to be a minimum of 1/4 inch apart. See later for how wide to mark the blunt end of the slit. Sew down one side of the slit, across the bottom, and up the other side. Cut half way between the stitching lines, then into the corners at the end. and good light so you can see the stitches. Some people find it helpful to put a pin in the corners to make sure you don’t cut the stitching. The quality and strength of the end depend on this cutting. Press the side seams flat. Press the seams open if it’s possible to get at them (a point presser may help if you have one). and press, one side at a time. Flatten the slit out and press the end. How wide to stitch across the bottom ? Vogue Sewing 1982 and Alison Smith ‘The Sewing Book’ (lingerie expert) tell you to take one stitch across the bottom of the slit. One stitch across the bottom means the end of the sewing is 1.5 mm, 1/16 inch wide. If a strip that wide is cut in half, the seam allowances are less than 1-mm, 1/32 inch wide. For most fabric weaves, that is very little substance. So I think such a narrow bottom of the opening only works well in finely woven fabrics. And I think you need good technique, to sew and cut very accurate straight lines. And use fine thread. I would have difficulty with the technical accuracy of the sewing and cutting needed. This is the width recommended in ‘Professional Sewing Techniques for Designers’. Taking two 1.5 mm stitches gives an end measuring 3 mm, 1/8 inch. So the seam allowances are 1.5 mm, 1/16 inch wide. 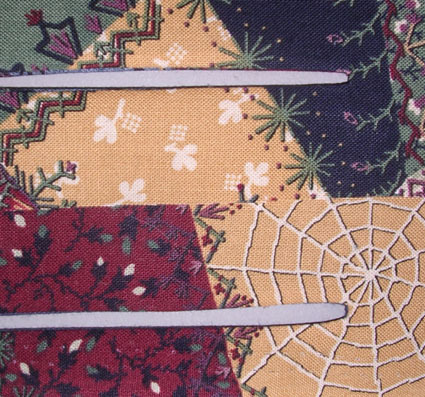 This is acceptable with a fabric that has as fine threads and is as tightly woven as a typical quilting cotton. Here is the result I achieved without difficulty (no interfacing). The result is sufficiently neat. I don’t think anyone is going to notice the end of the opening isn’t a point. But this does depend on the fabric. Here is a loosely woven tweed, sewn with 2 stitches at the end. As you can see, if this slit was cut down the middle, there would only be one fabric thread in each seam allowance. Not a strong result. This is the width at the bottom of the slit in Kwik Sew beginners’ pattern 3302. I think this is a good width for a first attempt. But I don’t think it’s necessary with a cotton/ poly-cotton broadcloth type weave, once you’re confident you can sew and cut reasonably accurately. Here are a 2-stitch end (above) and a 3-stitch end (below) in quilting cotton. So 3 stitches are not necessary in a weave like a quilting cotton. But I think they could be good for a coarser weave such as linen or a slub silk. 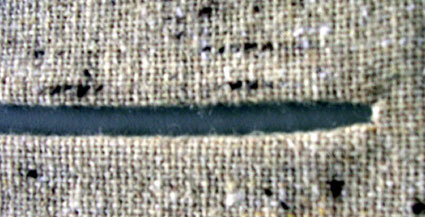 Here’s the loose weave fabric, sewn with 4 stitches across the bottom of the slit. Not too bad at all. Not prize winning technique (or photos ! ), but the seam allowances don’t feel insecure. – sew a blunt end to the slit. – vary the width of the blunt end according to the weave of the fabric. – test fabric – interfacing combinations. I’m very pleased this feature is now possible for me. Also other sharp inward corners on a facing, such as scallops. This entry was posted on February 27, 2010 at 7:42 am and is filed under sewing technique. You can subscribe via RSS 2.0 feed to this post's comments. Both comments and pings are currently closed. Thank you. This is super helpful as I fall into the “oh no, a faced slit, what can I do to avoid this!” camp. I find them super difficult to do. Really appreciate the time you put in to make this tutorial so helpful and clear. I too have been sewing for years and have had great trouble with slit type openings, so a big thank you from me. It makes complete sense when you show it like that with all the pictures. Thanks for the comments – I’m relieved to know very experienced sewers have problems with this too ! OMG! Finally I got it. Ive searched high and low for a tutorial that yielded perfect, no wave slits and I’ve found it. Thanks a lot!